Catherine Anyango and David Zane Mairowitz's Heart of Darkness. 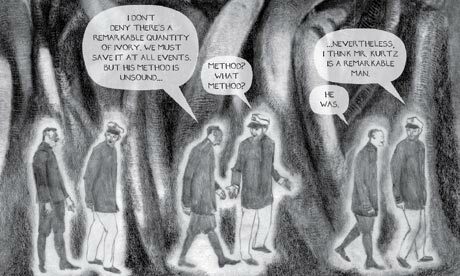 Sam Jones of The Guardian website reports that Catherine Anyango, artist, and David Zane Mairowitz, author of Introducing Kafka, have collaborated on a graphic adaptation of Joseph Conrad's Heart of Darkness. In the 108 years since it was published, Joseph Conrad's colonial fable Heart of Darkness has infected TS Eliot, been excoriated for racism by Nigerian writer Chinua Achebe and transplanted to Vietnam by Francis Ford Coppola. Now the book has been reinterpreted as a graphic novel in whose monochrome pages Conrad's exploration of power, greed and madness plays out as disturbingly as ever. Catherine Anyango, whose drawings are peppered with David Zane Mairowitz's adaptation of the text, had her doubts about tackling the Polish-born novelist's most famous work. Those reservations had more to do with the original medium than the enduring controversy over Conrad's views or the familiarity of Heart of Darkness. "I wasn't sure initially if it was a good subject for a graphic novel as the writing is so dense and the style of it is partly what attracts me to the book," she said.